Sometime in the early 1940s, three boys and a dog discovered a series of caves near the village of Lascaux, in the Dordogne region of southwestern France. Actually, the dog made the discovery; the boys just followed him. On the walls of the caves they found more than 600 paintings, mostly of animals, executed in manganese and iron salt and ocher, and hundreds more engravings. The paintings became a subject of fascination to anthropologists and prehistorians. Who had made them? And when? And why? And could they be the first examples of art in all of human history? Alas, within 20 years, the caves had become so overrun with curious visitors that the human activity was starting to affect the paintings: there was an outbreak of mold. And so, in 1963, the caves were closed except to those with a professional interest in the paintings. Everybody else had to go see a series of replicas that were on display nearby at an exhibit known as "Lascaux II." Just so nobody felt cheated, researchers took pains to make sure that the copies were as exact as possible, from the drawings themselves to the textured surfaces they were sketched on. And now, for the first time, replicas of the Lascaux paintings will be in the United States and on display at the Field Museum as "Scenes From the Stone Age: The Cave Paintings of Lascaux," starting next Wednesday, 3/20, and running through 9/8. The exhibit at the Field, which was developed by the French government, will feature five panels, says Robert Martin, an anthropology curator at the museum. "They're five of the best sequences from the cave." It's hard to tell exactly when the Lascaux paintings were done without any organic material, Martin says, but the best guess, based on the age of skeletons also found inside the caves, is that they date back 17,000 years ago to the Magdalenian period at the very end of the Stone Age, just before humans decided to give up their nomadic hunting and gathering existence and form permanent settlements. Most of the paintings are of horses, bison, and mammoths. It was the mammoths, Martin says, that "gave the game away" and let early researchers know these paintings were seriously old—not mere medieval doodlings or Roman graffiti. But they challenged earlier notions that Stone Age people were nothing more than musclebound hunters who grunted a lot and whose greatest achievement was fire. "The paintings are extremely well done," says Martin. "Some of them use perspective. People didn't think we had perspective until the Renaissance. They're three-dimensional: the natural relief of the rock brings the animals to life. And of course they didn't have electric lights; they used torches, and the flickering flames gave the pictures a sense of movement." This drawing of bison running in opposite directions shows the Lascaux artists knew how to use perspective. No one is still quite certain what the paintings were for. Early researchers theorized that they functioned as a sort of sympathetic magic, or maybe wishful thinking, where people drew the animals they hoped to kill. But the bones on the floor of the cave showed that the people of Lascaux weren't eating horses and bison and mammoths. Instead they hunted and ate reindeer. Which they never bothered to paint. "Reindeer were boring," Martin speculates. "Mammoths, horses, and bison were a big deal." Instead, Martin and other current researchers believed that the caves were a sort of religious sanctuary. The drawings were done by shamans in a trancelike state brought on, probably, by hallucinogens. There were other symbols in addition to the animals and, most interesting to Martin since he is an anthropologist, a single drawing of a human. The human figure is in the least accessible part of the cave, down in a shaft that requires a ladder to get to, which leads Martin to believe it was of great significance. "It's a strange picture," he says. "It's almost a stick figure. The human is leaning at an angle, and he's surrounded by spears. The human has a birdlike head. It makes me think of shamans. There's a bison nearby with its intestines dangling on the ground. No one knows if the guy killed the bison during a hunt. It's magic." The human drawing wasn't included in the Lascaux II exhibit, but a replica was created for the exhibit that will be at the Field Museum. For years it was believed that the Lascaux paintings were the earliest examples of what might be called art—although they were created for magical/religious purposes, not self-expression. There were other paintings that were just as old, scattered throughout southern France and northern Spain, but none that were older. That theory took a major hit in 1994 with the discovery of the Chauvet cave paintings in the Ardèche region, in south-central France. 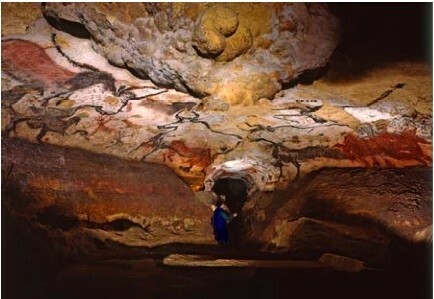 (The caves were named for Jean-Marie Chauvet, the French park ranger who discovered them.) 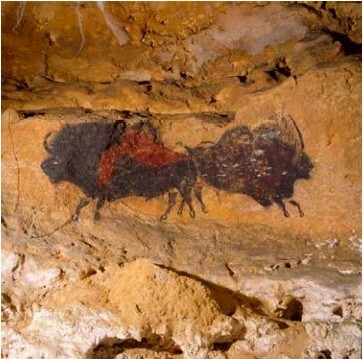 The Chauvet paintings have been estimated to be 35,000 years old, more than twice as old as Lascaux. "We imagine progress, that you start with the primitives and end with Lascaux, the Sistine Chapel of Magdalenian art," says Martin. 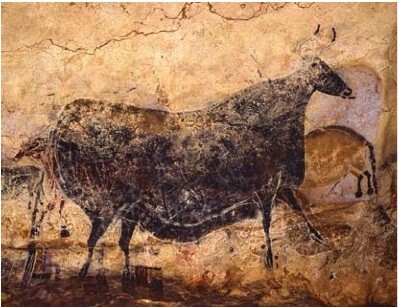 "But the Chauvet paintings are just as skilled as Lascaux. They used different animals, owls and lions." Unlike Lascaux, though, no copies have been made of the Chauvet drawings and the cave has always been closed to the public—except for Werner Herzog, who was allowed inside to film a documentary, Cave of Forgotten Dreams. Martin doesn't think the inconvenient truth of Chauvet will interfere in the slightest with Chicagoans' enjoyment and appreciation of the Lascaux exhibit. "The Lascaux paintings are not the earliest," he says, "but they are the most familiar. They're iconic, like Lucy [the Field's Australopithecus aferensis skeleton] is iconic. "For many people in America," he continues, "this is their only chance to see the cave paintings close-up. It makes a real difference seeing them in three dimensions instead of in a flat photo." The Field Museum, though, being the Field Museum, and in possession of a magnificent collection of prehistoric artifacts, plans to put its own spin on the Lascaux exhibit, different from anything than can be seen in France. Graslie was a 20-year-old aspiring artist who visited a zoological museum on a whim. Four years later her vlog, the Brain Scoop, earned her an unusual gig at one of the world's largest natural history museums. The Pilsen bakery blends traditional Jewish and Mexican flavors—this time without flour. "People think slavery is a southern story. It’s not a southern story. It’s an American story."